It was all over, especially the shouting, little that it was, as the San Diego Padres wrapped up their 2015 home schedule at Petco Park. And oh, by the way, in this season of their continued discontent, the Padres humbled their apparent arch-nemesis Milwaukee Brewers 3-1 behind Ian Kennedy’s best game of a 9-15, .428 ERA season. Believe it or not, the Brewers had won the last five games in a row against the not-so-fabulous Friars. Escondido has had a checkered past when it comes to Major League Baseball, the type of game they tried, and often failed, to play at downtown San Diego’s Petco this year. Just five years ago, pseudo Padres owner Jeff Moorad declared his intention to buy the Padres AAA Tucson franchise and move it to Escondido. Keep in mind, the ambitious former celebrity player’s agent Moorad never really bought the Padres. He leveraged a buyout of Rancho Santa Fe’s John Moores and tried to pay on time with what was for all purposes a liar’s loan. We’re talking 2010, guys, when the entire real estate and financial markets did the same and bankrupted the country. In this case, MLB eventually wrested the team back from Moorad, returning it to Moores, a close friend of then-commissioner Bud Selig. As fortune would have it, Moores’ fortune to be precise, at that point the regional Fox Sports networks sprung up paying outrageous prices for the rights to televise MLB games. Live sports programming just happens to be the sole revenue generator on commercial TV with all other formats bleeding money. When Fox came calling with Moores in charge, he made out like a bandit flipping the team over to Ron Fowler, another long and not so good story, for $800 million. Moores used the money to buy super-glamorous hotel properties and do what he does in the wonderful world of charity and jet sets..
As for Escondido’s AAA franchise, that dream lasted all of six months. The plan was to build a $50 million stadium at the site of the Escondido Flea Market with redevelopment bonds as financing. The California Legislature stepped in along with the California State Supreme Court and blocked the use of government funds to finance private sports stadiums. Sorry, Jeff, but then again, he blew more smoke than a chimney anyway. The Coscarart brothers were next up in the 1930s. Joe Coscarart was an infielder for the Boston Braves from 1935-36. Younger brother Pete Coscarart had a longer career. He played second base and shortstop for the Brooklyn Dodgers from 1938 to 1941 and Pittsburgh Pirates from 1942 to 1946. He played in the 1940 All star Game. He helped start a player’s union, scouted and worked for decades in real estate. Troy Afenir and Randy Johnson, each from Palomar College, played some major pro ball. No, not THAT Randy Johnson, the MLB Hall of Fame Cy Young perennial Big Unit, our Randy Johnson played third base for the Atlanta Braves from 1982 to 1984. He then went sushi and sayonara, playing for the Hiroshima Toyo Carp from 1987-88. He now scouts and is based locally. Afenir donned the tools of ignorance for the Houston Astros in 1987, Oakland A’s from 1990-91 and Cincinnati Reds in 1992. He hit .190 with no home runs in 79 MLB at-bats and now coaches at Palomar. Petco Park, Andrew — UGHHH!!!! 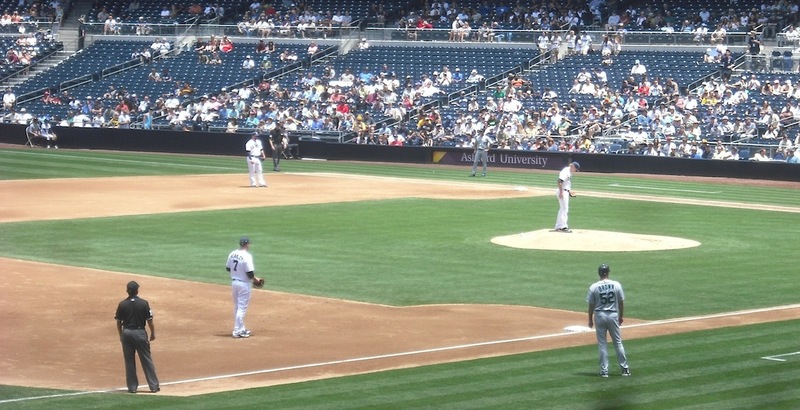 –Cashner on the mound. This day, Thursday, Oct. 1 is a day that will long live in American Pastime infamy, or something like that. This was the last Padres home game of the season. When the game ended, what was left of the Padres squad of unfortunates literally gave the shirts off their backs, one game-worn jersey each to lucky fans who won a charity raffle prize. About 22,000 fans sat in the comfortable Petco air, laid-back as one would expect witnessing a 3-1 game that for some unGodly reason lasted more than three hours. What the heck was going on all that time? Between, the beer and the barbecue, nobody seemed to care. Even when the giant video boards that now make Petco look like downtown Ginza in Tokyo at night implored the crowd to make some noise, it was so nice and polite almost like a library where they played a little rounders, don’t you know, between bouts with a smart phone. One of the final games highlights was the giant left field HDTV scoreboard looming like the Great Gatsby’s Eyes of T.J. Eckleburg spitting out so-called fan-cam images aimed almost entirely at making fans look as ridiculous as possible. Many times, the screen would put a celebrity image in the left and the image of a fan who might or might not resemble that person on the right. Justin Bieber? Check. Johnny Depp? Check. This fan-scam went on for about six innings. The seventh inning proved its grand demise. The screen flashed an image of Chewie from Star Wars on the left. It presented a mountain man of a fan who, it must be said in all fairness, looked a lot like Chewie on the right. Guess, fan-scam doesn’t have a live 5-second delay, because the fan in the cam flashed the universal finger of displeasure at the screen long enough to humiliate the fan-scam cameraman. So that fan-shall-we-say-friendly feature went by the wayside. No more fan-cam for you, fans. No need to say, what with the technology flashing and jiving all over the park, closer Craig Kimbrall finishing off the Brew Crew and a long day’s baseball turning into night, that was all she wrote for another season in the sun at ye olde ball yard. Heading north towards home, un set in the west, sure enough to rise again tomorrow in the Annie east, rest assured Escondido Padres fans, another season surely will come, maybe with a few more wins and wonders to savor.